The Sarod is a stringed instrument used in Hindustani (North Indian) Classical Music. For a more detailed description of the sarod and its variants, you should refer to the sarod entry on Wikipedia, to which I have occasionally contributed. The sarod is played in many styles, and I essentially follow the Ustad Amjad Ali Khan school of sarod playing. This style is the most recent of all the prevalent styles. 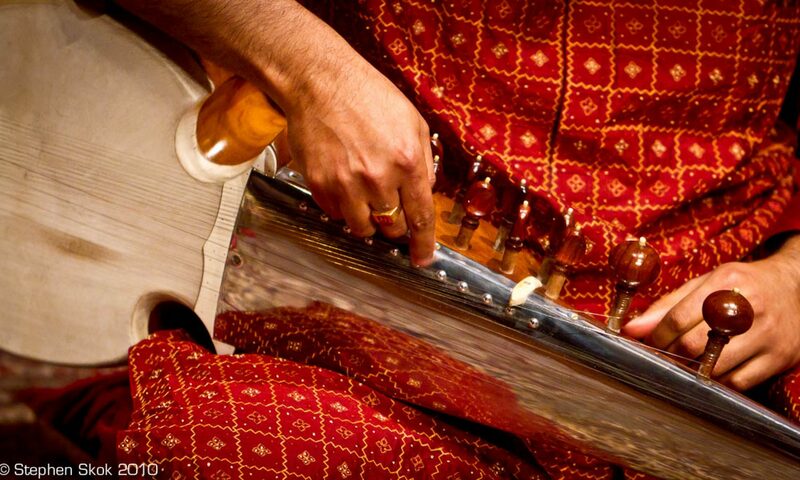 One of the best descriptions of the sarod is that it is an instrument with liquid sounds – due to the resonance of the instrument, the sound lingers as the instrument is played. The notes have a historical component from previous notes played and together, they form a wholesome sound. I feel that some raagas come into their own on the sarod e.g popular 5 noted (pentatonic) raagas such as Malkauns, Hamsadhwani, Durga, Kalavati and Bhopali as common examples. The sarod also does well in terms of serious raagas such as Darbari Kanada and Marwa, although the latter is not commonly heard on this instrument. The instrument requires the tip of the nail to be used to press the string against the fretboard, so the nails must be filed every now and then to level out the grooves cut into the nail by the steel strings. The best sarods are made by Hemen & Co in Rashbehari Avenue in Kolkata (Calcutta), India. Most professionals use sarods made by him. The skin needs to be replaced every so often when it sags – this is done by an expert repairer. Hello. Do you give online lessons via Skype? If so, what do you charge? If not, do you know of any other online source for instruction? Also I was thinking of getting your book but it is really very expensive for being so short and it seems like it has some pretty basic information about classical music in general. Why so pricy? I guess it is pretty much the only book out there for sarod. How do I find someone to replace the skin? You can try sarod teachers in California -I’m not aware of any in Colorado. ..otherwise you can attempt getting a skin from India and trying yourself….but you really need to be confident re the technique..
Hi Bryan, depends on where the wood has chipped off from, but if it’s the main body, then should be ok to glue it back. Re: skin, that needs replacement after a few years at the most – find a sarod teacher in California who can do this for you. The alternatives are to go to India or attempt it yourself, if you’re very confident.